The Blytheville Middle School eighth grade Gifted and Talented students who attended the U.S. Space and Rocket Center program from Oct. 5-7 included (from left) T.J. (crew trainer), Jacob Pruett, Carzlon Ford, Rushanti Taylor, Shakeyiah Fountain, Grant Langston, GT director Diane Hay, Carlos Wells, Brian Jones, Dylan Casinger, Anayiah Byrd, Shannon Page, Drake Jackson, Dennis Camp, Justin Braylock, Christina Andrews, Bailee McCustion, Connor Frazier and (not pictured) David Skaggs. 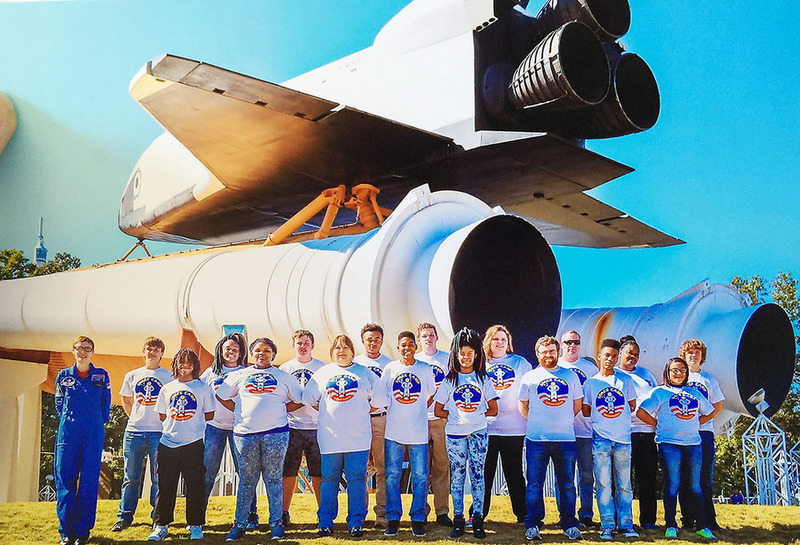 The eighth-graders in the Gifted and Talented program at Blytheville Middle School recently finished perhaps their school’s best field trip, spending three days at the U.S. Space and Rocket Center program at Huntsville, AL. The students told their stories of visiting the center to members of the Blytheville School District’s Board of Education on Oct. 24, and every person involved with BMS was taken aback at the opportunities those students had to experience everything involved in the program. The students and chaperones, headed by G/T director Diane Hay, toured the program Oct. 5-7. The chaperones included David Skaggs, Dennis Camp, Shannon Page, Christina Andrews and Drake Jackson. Hay said later that the students were tremendously excited to be going to Huntsville, and it showed in their paying attention to everything the program counselors explained to them, from facts about space history and space program activities to the students earning the program’s “Best Mission” award. The students participated in “Pathfinder”, a three-day, two-night program for Space Camp. They enjoyed a program that included a space mission, space history and astronaut training on authentic training simulators. During the simulated space mission they worked in either mission control or launch as a part of the flight crew aboard the Atlantis Orbiter Simulator. Members of the “Orbiter” launch crew included Anaiya Byrd, commander; Grant Langston, pilot; Bailee McCustion, mission specialist 1; Jacob Pruett, mission specialist 2; David Skaggs, payload specialist 1; Shakeyiah Fountain, payload specialist 2, and Dennis Camp, payload specialist 3. Members of Mission Control included Rushanti Taylor, flight director; Connor Frazier, EECOM; Shannon Page, CAPCOM; Dylon Casinger, FDO; Christina Andrews, PAYCOM, and Carzlon Ford, GNC. Space Station members were Carlos Wells, station commander; Justin Braylock, flight engineer 1; Drake Jackson, flight engineer 2, and Brian Jones, station scientist. Diane Hay was the flight historian (photographer). Hay added that the mission is conducted in competition with other trainee groups attending the camp, with BMS winning “Best Mission” for its problem-solving skills and teamwork. Space program activities included a simulated shuttle mission, the "Five Degrees of Freedom" chair, Multi-Axis Trainer, public museum simulators and an IMAX® or National Geographic movie about space travel. Among the unique activities the students participated in was the Space Shot simulator. Hay said that the simulator exhibited rocket speeds of 140 feet straight up in 2.5 seconds, including four Gs of force on launch, two to three seconds of weightlessness out of their seats and then a 1 G free fall. The G-force is a force acting on a body as a result of acceleration or gravity, informally described in units of acceleration equal to one G.
They also “journeyed” to Mars and, while climbing the Mars Rock Wall, discovered that the red planet can be a very dangerous place to visit. Arid, cold, rocky and apparently lifeless, Mars has very little to offer the casual tourist. Mars, however, is an extreme sports lover’s paradise with its endless hiking trails, deepest canyons and tall volcanoes. The center’s “ISS: Science on Orbit” exhibit gave the students a true sense of living and working in space. And the “Science of Archimedes” exhibit showcased the inventions and scientific discoveries of Archimedes, the father of modern science, and took them on a journey through history and science with a look at the machines of the ancient world.